Email Anyone Anytime allows you to send an email with multiple to, cc, bcc and merge fields from any record type as many times as you want. The value of the parameter will overwrite the value in the “to” field of the email template that is being sent. The ID of an existing e-mail template in Infusionsoft. Field values within the template, specifically to, from, cc, and bcc, can be over-written by the to, from, cc, and bcc parameters of this plug-in. A “from” address for the outgoing e-mail. If the “from” address is omitted, the fixed value within the e-mail template will be used. If no “from” e-mail is found either as a parameter in the HTTP post or designated in the email template, “noreply@infusionsoft.com” will be used by default. 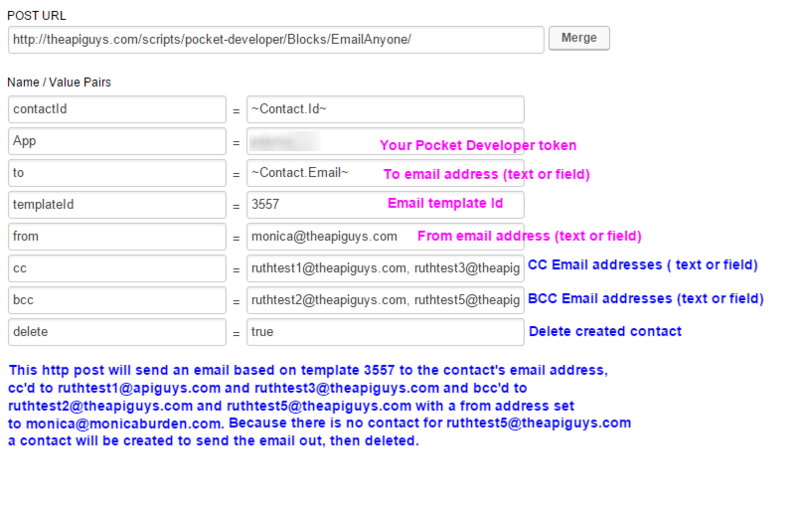 Set this to “true” if you want Pocket Developer to delete the contact that is created when no contact exists for an email address in to, from, cc or bcc. Default is set to false. Pocket Developer adds a tag (Pocket Developer -> Created by Email Anyone Anytime) to all contacts it creates for the purpose of sending an email. If you see a 400 error in the campaign history, check that your email template must Ready to Send? status is set to Yes. The “to” fields configured in the email template will be overridden by the plug-in. If “from”, “cc”, and/or “bcc” parameters are added to the HTTP post, these values will override what is configured in the email template for those values. When used with the Email Anyone Anytime plug-in, the subject line and email body in the email template can use our Advanced Merge Field Notation to merge information that is not available in standard Infusionsoft merge fields. For example, you might merge the product purchased in the subject line or information from the contact’s company record in the body of the email. If you use Advanced Merge Field Notation in the subject or body copy, this email template cannot be used as a standard email template. Without the plug-in, the merge fields will appear as text in the email, without being merged. You might want to consider marking email templates that have Advanced Merge Field Notation so they aren’t used directly in campaign builder or changed accidentally. Use the Universal Delay Timer with Email Anyone Anytime, instead of standard Infusionsoft delay timers. You can configure the Universal Delay Timer so contacts are not “in” the campaign while waiting for the next email, enabling you to effectively run them through the same campaign multiple times simultaneously.